Join me as I roll up to Morrow, OH to Cellar Dweller Brewing. This adventure was mostly on separated trail! I have known about Cellar Dweller pretty much from the beginning of my living here in Cincinnati. It was, however, one of the two local breweries that I considered unbikeable (the other being the very nice Mt. Carmel Brewing). Then came the day I went to the Lunken Beerfest a couple months ago or so. I stopped by the Cellar Dweller booth for some tastes. The conversation turned to the fact that I had biked to the Fest. The man told me that they sometimes have cyclists visiting the brewery (well, I think he might have said “all the time” but I think that has to be an exaggeration). He said they’re located just a bit off the trail. Cellar Dweller’s beers are good! I was impressed at the Beerfest and I was again at the brewery. 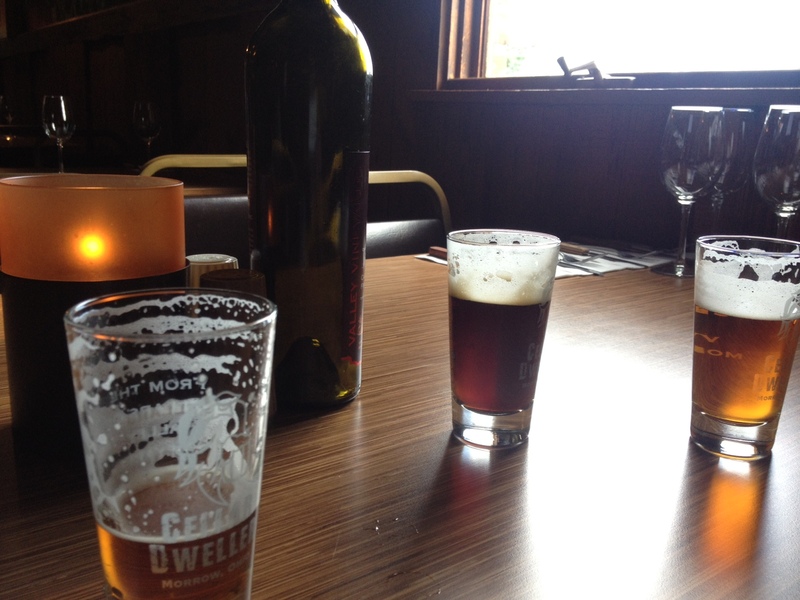 The experience at Cellar Dweller was a bit of a departure from the norm. See, Cellar Dweller is a fairly young baby of the larger and far more prominent business, Valley Vineyards. 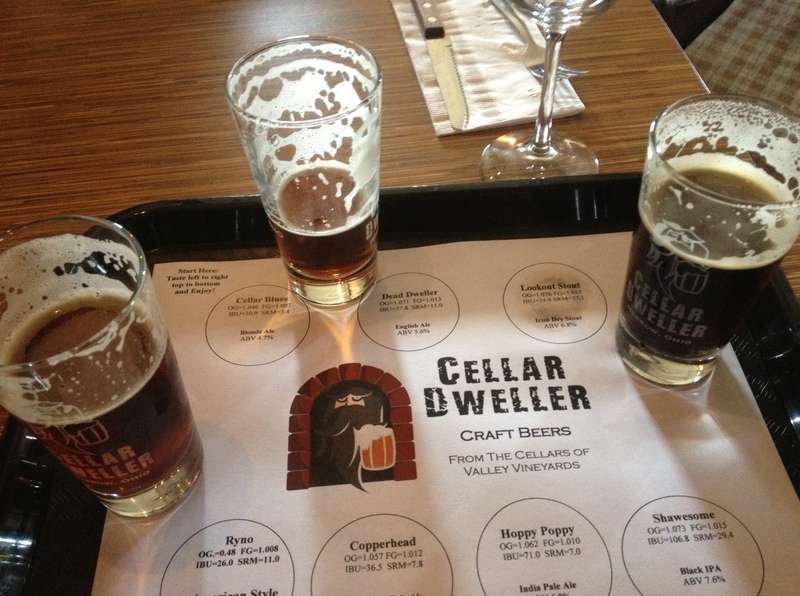 Cellar Dweller’s beers, as their slogan suggests, come from the cellars of Valley Vineyards. The place is basically a big restaurant with a big patio. Now, I say restaurant, but I don’t think they really serve food. They have some sort of thing going where they sometimes offer cheese plates, and they have big grills on the front patio where guests can bring their own meat and cook it. I guess they offer salads, desserts, etc. to go along with it as well. It was interesting for this guy who is simply out for local craft beer. 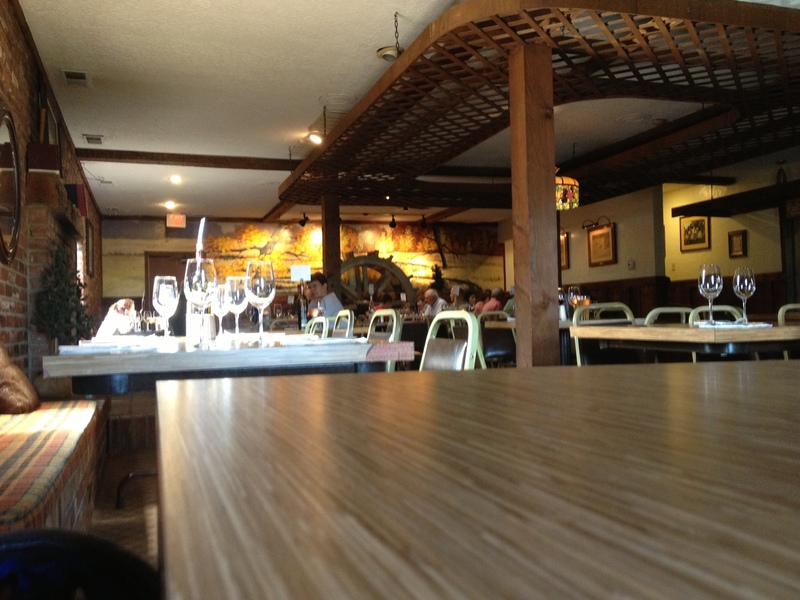 I found myself in a restaurant-like atmosphere. As the hour progressed, I saw more and more people, mostly elderly and not appearing to be hurting for money, filter in and take their reserved seats. Well, it is a winery I guess, and not exactly Napa. See my fellow patrons. I feel young and rowdy. By the way, I love wine and wineries. My wife and I used to make the 5 hour trek from Seattle to Walla Walla for spring wine release. We had a handful of neat wineries on Bainbridge Island as well. I rolled in after some confusion as to where exit the trail. I was drenched in sweat on this 90 degree humid day, having pedaled some 35 miles. My bike locked up to the bike rack out front (that’s right, a bike rack! ), my soaked shirt draped over the rack and my backup shirt donned, I entered the air-conditioned building after observing the expansive front patio and the guy lighting up the big barbecue grills. As mentioned, I kind of blew it on my directions. I had investigated the route a couple days prior, consulting Google Street View to get an idea what it looks like where I was supposed to leave the trail and ride on-street the fairly short distance to the brewery. I should have boned up the day of my trip. When I neared Morrow, I saw a cross street that I suspected was where I needed to exit the trail and turn. I doubted myself and proceeded just beyond the street. Stopping to see if my phone could help me, I encountered a nice guy who slowed to ask if everything was okay. I took the opportunity to ask if he knew where Valley Vineyards was and if the street just behind us was the one that led there. Well, I thank the guy who was very nice, but between him and my phone, I was encouraged to proceed on the trail which turned out to take me some three miles too far. Then, I got off the trail and onto a busy road that began to go steeply uphill. My legs and body were not excited. I pulled over, checked my phone and decided I needed to go the other way. After trekking that way for a while on the busy road, I again pulled over, deciding to place a call to Valley Vineyards. Talking to the woman and thinking things through, I got an idea where I had gone wrong. 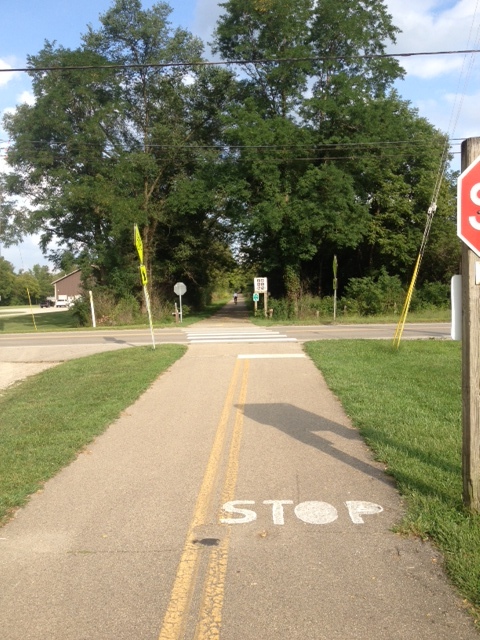 Yes, I had gone too far on the trail then pedaled around Morrow in vain. This as I was about drained of sweat. Cellar Dweller is located a bit before you get into Morrow on the trail (coming from Cincinnati). The road at which you exit the trail is named Stubbs Mill Road, people. Remember it. One of the women at the brewery told me they had a sign up on the trail for a while, but it kept getting removed. 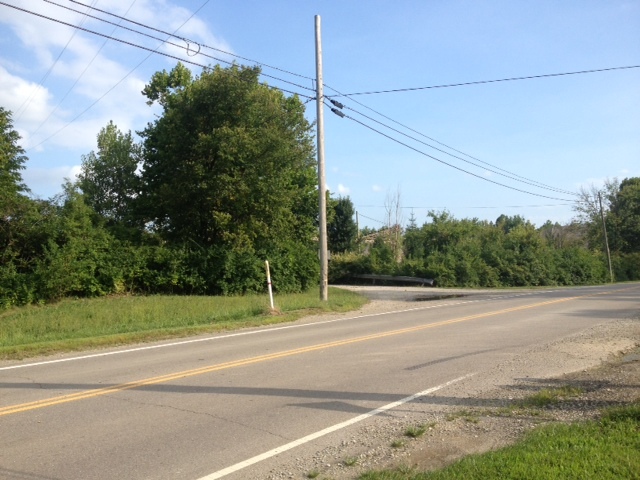 There is actually a small wooden sign across the road as you approach on the trail that bears the road’s name. THIS is the road. Get off the trail here and turn right! Then turn left at the light. As you approach your road. It looks like this once you’re on the road. Barely visible in this pic is the big gravel pit on the left – a major landmark. 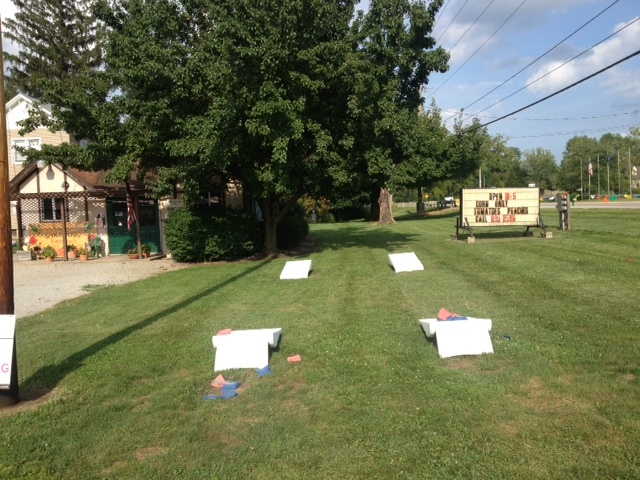 Looking the other direction you would see the giant wine barrel Valley Vineyards sign. I didn’t photograph it but I’m pretty sure you can find a pic of it. Notice the little market where the proprietors of this place sell their own fruit and vegetables. Neat! 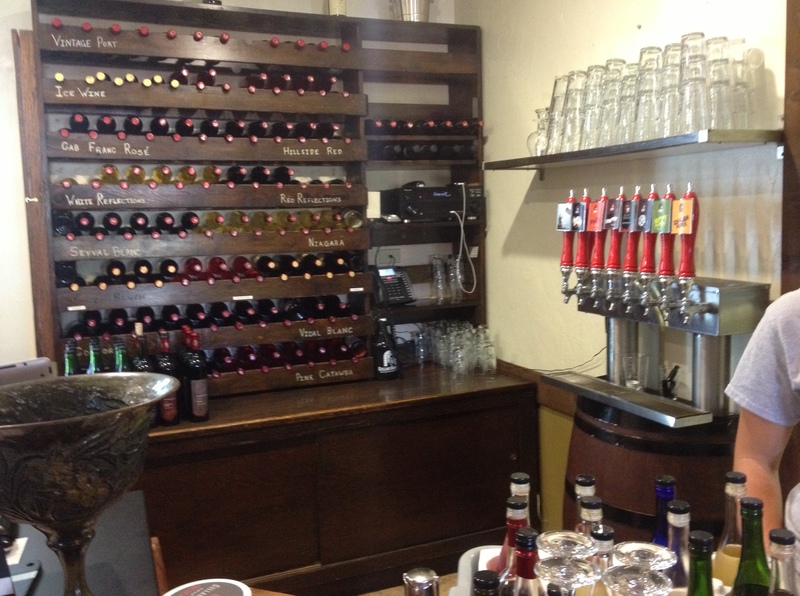 Right away I saw the red tap handles behind the counter and on the right, though visually they play as significant a role as does Cellar Dweller to Valley Vineyards. I knew what I was there for and, for me, there was no missing those tap handles. Oh yes, I was getting my Cellar Dweller beer. That’s Cellar Dweller over there on the wall. I was greeted by a nice young woman in what appeared to be almost a uniform. Tasters were my poison of choice here. They offer a set of seven tasters for $8. The woman readily offered, though, that they offer individual tasters for $1. This suited me better, though I ordered tasters of six of their currently available seven beers. It was a good deal, Pedalpinters. The tasters were unusually large (though they appeared to intentionally fill them less than full). 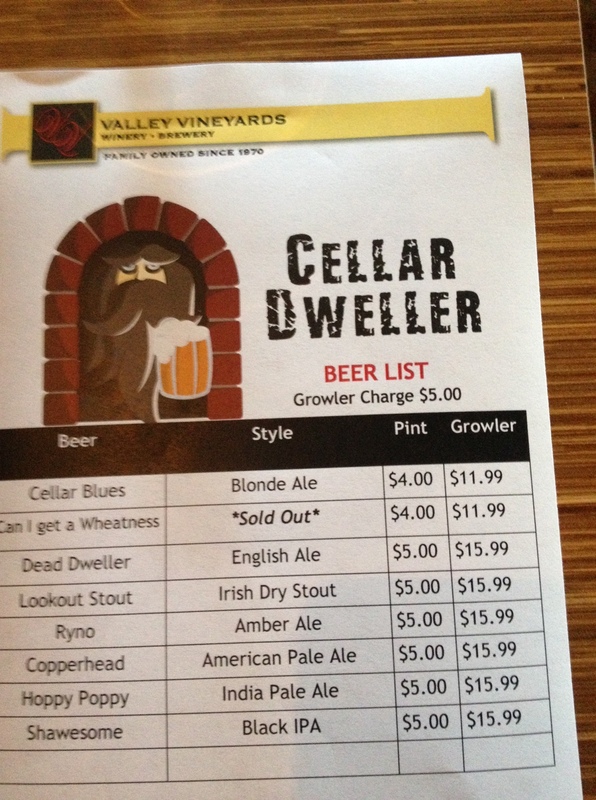 As you see in the menu, Cellar Dweller’s beers are essentially $5/pint save a couple which are of the feebler variety. Yes, this seems to be the law of the land at breweries and beer establishments: only the beers much lighter in gravity come at a more affordable price. Maybe this is a foregone conclusion to most, but I don’t remember it always being that way. Is it an Ohio thing? Is it a Midwest thing? I’d have to go back and visit the Pacific Northwest to find out. Sadly, I am actually glad to see they only charge $5 at a maximum. The price of beer just keeps going up my friends. $5 is the new $4. I took my paddle of tasters and – no, actually the woman offered to carry them for me – I found a table in the cool somewhat dim dining room. All the tables had cards displayed on them with names and the time of the reservations. I was prepared for this, as I had called a total of three times leading up to my adventure to get a feel for the atmosphere there. More importantly, I needed to confirm that they would be open before I blew a day of travel in vain. The deal is, comrades who are just out for a bit of beer and a bike ride, the place takes reservations and fills up with diners and winers at 4 o’clock. Prior to that, though, you are welcome to visit and enjoy the beer (and wine). Just make sure you are ready to vacate your table before the reservation time unless you want an uncomfortable moment. Makes you want to settle in and have a nice dinner with friends or family eh? Nah. I think I’ll ride 30 miles home now. Of the six Cellar Dweller beers I had, I enjoyed Dead Dweller the least. Dead Dweller is good. This tells you how I feel about these beers. Standouts for me are the Ryno amber which tasted a lot more like an IPA or hoppy pale than an amber. It is listed at 27 IBU but has to be hopper than that. The Lookout Stout and the Hoppy Poppy IPA are very good as well. Shawsome black IPA is good but not, to me, quite as good as the aforementioned. Just a matter of taste, but all quality beers! I’d like to try their wines sometime. At first I sat at a table for two not far from the gift shop/counter. Later, I moved to a big table diagonally across the room that was next to a front window, as I craved more light and a view outside. 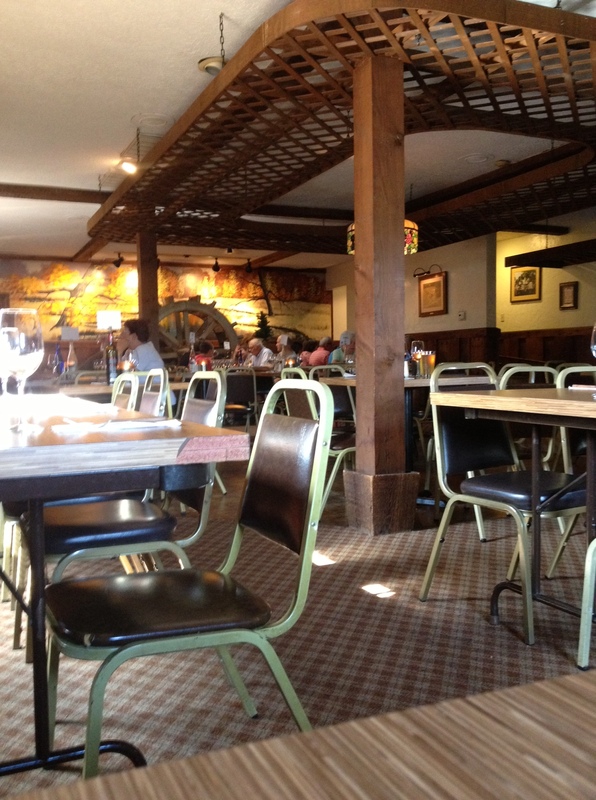 This table had a reservation time of 6:00 compared to the 5:00 at my first table. It was getting close to this hour because I had left home later than I wished, having had to deal with a flat tire before departing and of course getting a bit lost on the way. When I saw a significant amount of people saunter in and fill the area around the counter I figured I’d better get up there and pay lest I be caught waiting behind a crowd of distinguished guests, my time ticking away. I joined the crowd and settled up with the responsive friendly staff. To my surprise, there was a lull in the action a bit later for which I should have waited. From my window I was able to see my bike and the two other bikes locked to the rack that were there when I arrived. Yes, there were a couple other cyclists there, though I couldn’t tell who they were. I have the strong suspicion that most people that bike to Valley Vineyards do so from somewhere around Loveland (home of Cappy’s a place detailed in another of my posts), or maybe from some point to the North of the winery. I don’t know that the place sees many visitors from Cincinnati, a 65-70 mile round trip away. After thoroughly enjoying my tasting experience, I finally used the restroom. Yes, I had downed about 1.75 liters of water since leaving home in addition to my beer and just now had to pee a little. That’s how much I sweat. It was time to take off and start the ride back home. 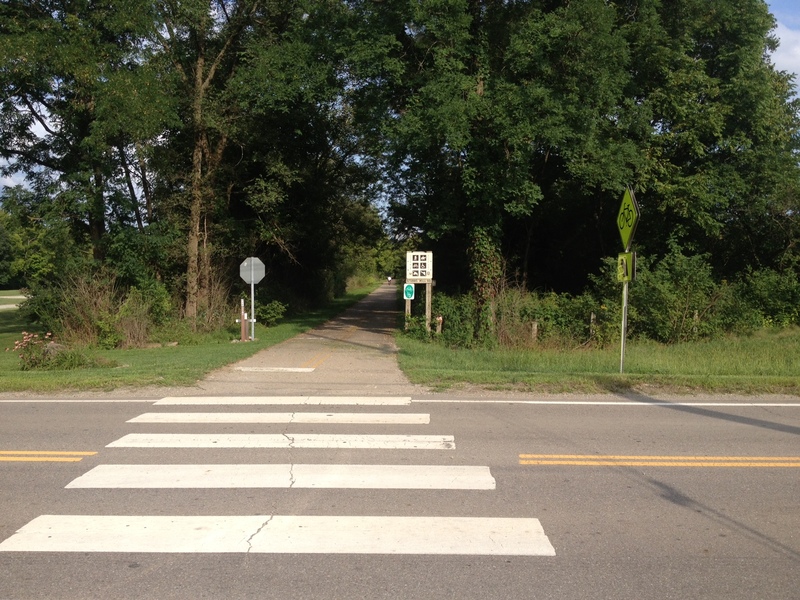 I exited on the gravel drive that runs parallel to the road, then joined the road. It’s not far until you reach the road where you turn right to reach the trail which is probably 1/3 mile away. The ride on the trail this day was peaceful and pleasant but tiring and, frankly, boring. Two hours each way does get old. Of course there is also the ride to and from the trail from my neighborhood which you will see on the map. I’m glad to have had this adventure and thus made it to the final Cincinnati brewery I had not visited. I’ll do it again, though maybe in the winter! Thanks for joining me on this adventure.